$10 Book Purchase: "Selling Insurance On the Internet"
Free Guide: "Online Selling Secrets"
Any Insurance Agent Can Build A Web Site - But We Teach You How To Build One That MAKES SALES! Why Pay Thousands of Dollars for a Quality Web Site? $500 Is All It Takes! Our Web Site Designs are unique. We don't just build a beautiful Web Site for you, but we believe in building SALES and MARKETING sites, that will pay for themselves many times over! While we can do the normal agency type site too, and we will, our specialty is designing MARKETING NICHE SITES. Why? Because they are the ONLY kinds of sites that will sell insurance. How Do I Select a Design? You can show us a site you like - either one of ours or someone else's - and we can emulate it. Or you can have us design a custom site. The cost never exceeds $500. Sometimes less. Of course if you ask for a site with more than 10 applications or sub pages, or ask for added features like chat, videos, etc., the cost can be a little more - but most sites do NOT need more than we give you on our basic plan. With our $500 packages you get a custom Home Page, an agency bio page, a privacy notice page, between 1-12 quote applications (you can switch some out for content pages if you want), links or embedded Google maps to your office, a service request form, Captcha Protection for your quote form (to avoid spam) a "thank you" page, and we can add your logo... plus a whole lot more! Are There Any Other Costs Besides the $500 Design Fee? Yes, just a few. If we design your site, we require the hosting of it to avoid conflicts and compatibility issues (as can happen using outside hosting services). Since our hosting rate of only $7.95 per month (billed annually) is just as competitive as any other public hosting company, that should not be an issue. You will also need a domain name (if you don't already have one), and you can purchase domain names at Godaddy.com or other domain registrar companies for about $15-$20 per year. Also, if you add additional services like chat, email gathering and mail lists, video spokespersons, or extra pages or features, they can cost a little extra, but that is totally optional. You can add a mobile site and join the two sites together for an extra $200.00. The fact of the matter is, that most "responsive sites" (same web site for both desktop and mobile browsers) look poor on one, the other, or both - so we offer a separate mobile site that looks great on a mobile phone, while leaving the main website looking great for the desktop or laptop users. The two sites are joined together, and will detect which browser is used, and direct the proper browser to the proper site. That way you get the best look for each user. You can do this in a few ways. 1) We will show you some real life sites below. You can see what our other clients are doing to get an idea of the quality of work we do. 2) Below our visuals, we have links to other sites, some agency type, and some niche types. You can get ideas of what you may want from those. Or, 3) You can show us a site you have found that you like, and we can price it out. What we do for many of our clients is to have them find a site they like. Usually it's a site that costs thousands of dollars to build. We show them how to get the same "flavor" at a fraction of the cost. We do this by removing the elements that make the site expensive, while keeping the general feel of it. We try to keep ALL SITES AT OR UNDER $500.00! 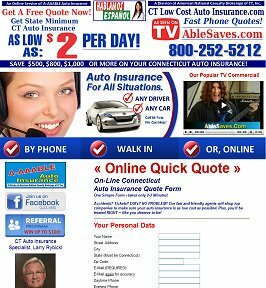 Specializing in Non-Standard Auto Insurance in the State of Connecticut. CT Low Cost Auto Ins. 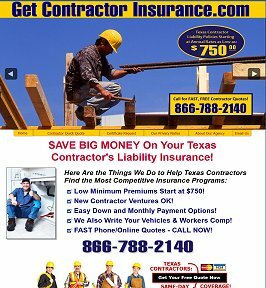 Specializing in Contractor Insurance Niche Site in the State of Texas. 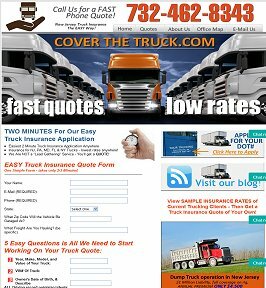 Specializing in Trucking Insurance in the state of New Jersey. 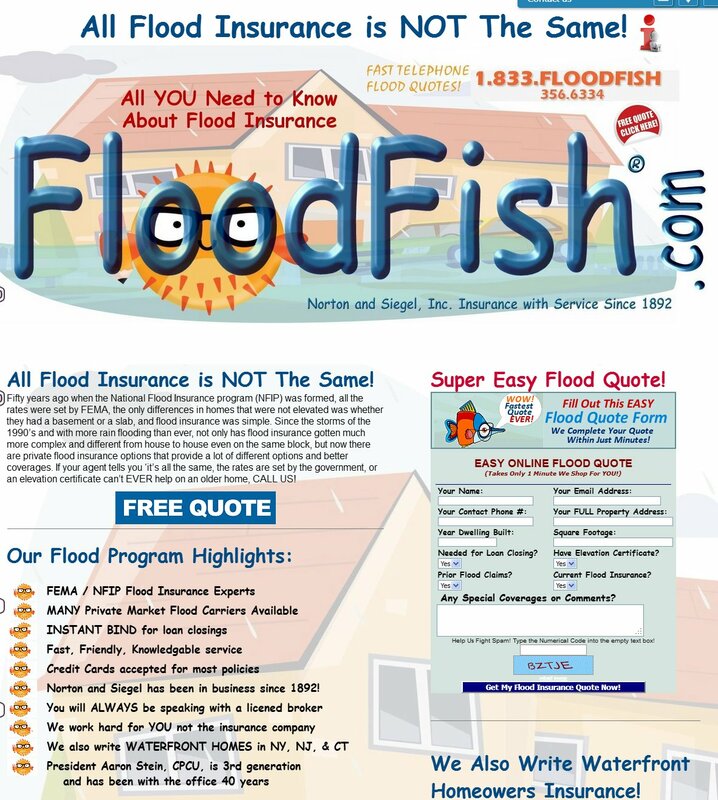 Specializing in Flood Insurance in all states. 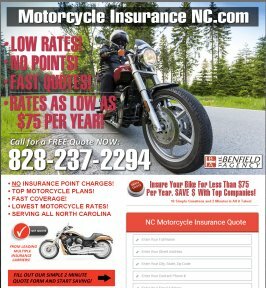 Specializing in Motorcyle Insurance in North Carolina. Download Our $500 Website Design Contract Today! Gary Savelli has been successfully selling insurance online for over 15 years. He speaks at national conventions and is author of the book "Selling Insurance on the Internet" (over 14,000 copies sold - Click Here to order yours). Need Help Managing Your Google Ads? Save TIME & MONEY! We have 15 Years Experience With Handling Google Insurance Ads... Get More Leads for Less Money. FULL ACCOUNT Management for only $79 Per Month!